National Bank Credit and Debit Cards now come with built-in chip technology. This gives you greater fraud protection when you use your card at a chip-enabled terminal. Your new card is not only more secure - it is also easy to use. Here is what you can look forward to as a cardholder. 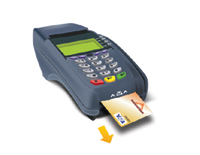 When you use your card at a chip-enabled terminal, the embedded chip generates a one-time use code. This code is virtually impossible to counterfeit and helps reduce in-store fraud. More merchants are accepting chip transactions every day. Whether you check out using chip technology or swipe your card, you can pay with confidence. Simply swipe your card like you do today. However, if a chip-enabled terminal is available, insert your card instead and follow the prompts. See detailed steps to the right. ► Keep in mind, you can continue to use your chip card online and over the phone...the same way you do today. Plus get cash, check your balance and more at millions of ATMs worldwide. 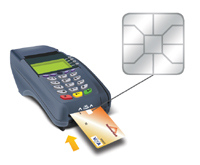 Also known as EMV or smart chip technology, it provides added security at chip-enabled store terminals and ATMs. Many countries have already adopted chip technology. And now, U.S. merchants and card issuers are starting to adopt it too. 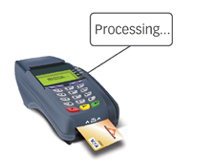 When you insert your card into a chip-enabled terminal, the card’s microchip generates a unique code for each and every transaction you perform. The code makes it extremely difficult for fraudsters to duplicate your account information and compromise your account. Your card number and PIN have not changed. For added protection, we changed the expiration date and 3-digit code (CVV) on the back of your card. Be sure to update your card information with any billers that charge your card regularly. Everywhere! When a retailer updates their terminals to accept chips, just insert your card instead of swiping. When in doubt, swipe your card. If the terminal is chip-enabled, it will recognize that your card has a chip and prompt you to insert it instead. Does my chip debit card work at the ATM? Do chip credit card payments require PINs? ATM transactions will require you to enter your PIN number. Credit transactions in countries other than the United States may require you to enter your PIN as well. To program your PIN number, call 1-888-891-2435. Contact us toll-free at 1-800-552-4123. 3. Remove your card when prompted and take your receipt. You may need to sign for your purchase or enter your PIN. If a merchant is not yet chip-enabled, you can still swipe your card to pay.